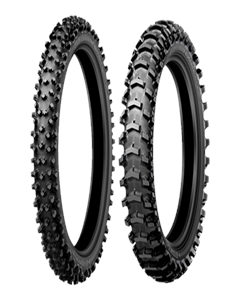 The MX12 delivers next-level performance in a broader range of sand and mud terrain through increased cornering acceleration grip, enhanced handling in ruts and increased bump control. Deliver optimum traction in sand and mud conditions, they are also available in mini sizes as well. Great performance for tough environments. Offers more progressive cornering action and additional slide control. Provide grip and handling for off-road performance. Designed for soft-terrain applications, the MX12 excels in extreme sand and mud conditions. Innovative tread pattern includes new V-Block technology that increases traction, and does a better job clearing the tire in muddy conditions to maintain maximum performance. Tread pattern includes Dunlop’s exclusive block-within-a-block Progressive Cornering Block Technology (PCBT) in the rear for enhanced cornering traction and slide control. Recessed flex joints between tread blocks improve compliance for enhanced traction and ride comfort. Narrower tire profiles increase length of contact patch for improved bump absorption, and improved steering in rutted conditions.